What is the deliverability of Facebook.com email addresses? For those of you who took notice of the fact yesterday that Facebook altered users’ email addresses on site to use their Facebook.com pre-assigned email address first, you may be wondering: what sort of email deliverability is there on Facebook’s email addresses? I ran a very quick set of tests this morning with the help of a friend to find out. What took me by total surprise was this: sending a copy of the WhatCounts company newsletter to my Facebook account got through. What was even more surprising was that the Publicaster platform did not, despite the fact that I’ve authorized the Publicaster platform to access my Facebook account. Facebook Pages seem to not be able to receive emails at all, even from the account owner. Clearly, Facebook has some very odd, inconsistent rules when filtering email, and unlike other mail server systems, it doesn’t seem to return any messages when things do or don’t bounce. Our advice for email marketers? For now, if someone tries to subscribe to your email list using a Facebook.com address, ask them for a second address just in case it doesn’t get through. Facebook’s rules seem inconsistent and there’s no way to tell whether or not your email was delivered or silently redirected into the ether. 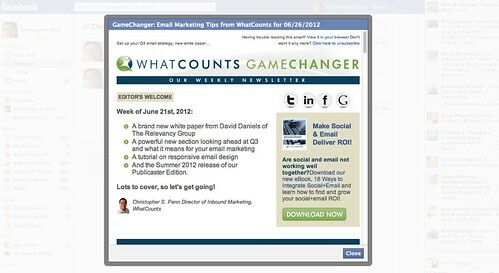 Please share this with other professional email marketers who are considering emailing to Facebook.com email addresses!